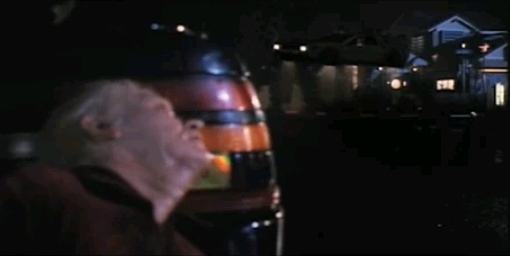 In Back to the Future Part II, Doc picks up Marty in 1985 and takes him to 2015. Then old Biff realizes the Delorean is a time machine. Old Biff steals the Delorean and travels from 2015 to 1955 to give the 1955 version of himself the 2015 sports almanac. When old Biff then returned to 2015 from 1955, shouldn't he have arrived in a way-different 2015? Instead, he arrives in the same 2015 that he departed, where Doc and Marty are still running around as if nothing changed. I think this is a problem created by perspective. When Old Biff takes the Delorean back in time, we viewers do not go along for the ride. We're left hanging in a 2015 that becomes obsolete when Old Biff changes 1955. Seems our 2015 has two options: continue to exist as an alternate to the 2015 Old Biff created, or cease to exist. Either way, still seems our 2015 would be unreachable by Old Biff and the Delorean on their return from 1955. Speculation: Old Biff returns to the changed 2015 (designated 2015A). Doc and Marty "transitioned" to 2015A without noticing. Why didn't they notice? Maybe because they were out on the street when it happened and Hilldale looks the same in 2015A. 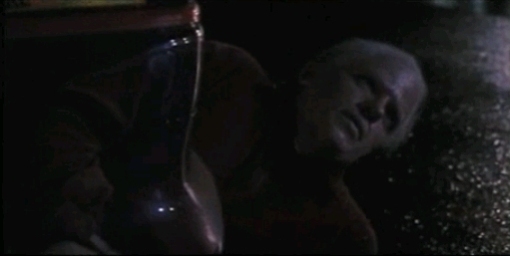 In scenes deleted from the film, Biff Tannen of 2015 fades out of existence (much like Marty was in the original movie when interfering with his parents' meeting) once arriving in the future, having been erased from existence in that time period. First, these events created a time paradox. Having created an alternate timeline by giving his younger self the almanac, the old Biff from 2015 no longer existed, once 2015A became part of the 1985A timeline. Another possibility is that Lorraine, in 1996 of the alternate timeline, shot and killed Biff. These events are never depicted in the trilogy, although Robert Zemeckis and Bob Gale suggest this theory as a way of explaining Biff's "disappearance." In all the Back to the Future movies, a major component of the plot is reality taking time to catch up to events. Typically, this is represented as pictures with gradually changing features, which the protagonists are trying to prevent from changing. Marty's family photo in the first movie, and the tombstone in the third are examples of this. From this behavior, we can infer it takes time for changes to propagate to the future. Otherwise, Marty would have blinked out of existence in the first movie as soon as he pushed his father out of the street; and the rest of the movies would have been... different, to say the least. So since old Biff returned to his present as soon as he interacted with his younger self, the changes hadn't had time to take effect, yet. This is also required for Doc and Marty to go back to the 50's. In the altered future, the new Doc and Marty would neither have had the ability, nor known about the change which needed fixing. I explained something similar to this over on the Sci-fi/Fantasy site, but this one is actually easier to answer. If the change you made in time affects the future you have to wait for it to catch up to you. An example of this is when Marty saves his dad he alters history but it takes about a week to catch up to his present and erase him from time. Even if he had jumped in the time machine and traveled back to 1985 Hill Valley he would have had to wait a week. If you travel back into time from an altered future point (from 2015 to Biff altered 1985) the transition is instantaneous. This is because you are traveling down the time stream rather than in static time waiting for events to catch up. At first this may seem like a contradiction but it really isn't. My belief is that the Flux Capacitor creates a temporary bubble around time travelers that allow them to be absorbed into a changed time line rather than sudden disruption. So Old Biff would not have been able to travel to future Biff ruled 1985 or even 2015 because he is such a completely different individual in those times as well as the world around him has changed so drastically. Marty was able to travel to an alternative 1985 instantly in the first Back to the Future because it was so close to his current 1985. In other words there is one time stream in Back to the Future. It can branch and make new futures but those are eventually absorbed into the one time stream. The further it branches off from the original time stream the longer it takes for changes to catch up to current time. So the answer is the greater the change made to time the longer it takes to affect it especially if there is a possibility of correction to the original time stream. I believe that 'Back to the Future 2' follows the same logic as the 2005 movie 'A Sound of Thunder' based on the Ray Bradbury story. In 'A Sound of Thunder' (the movie) when someone went back to the time of the dinosaurs and they made even the smallest change, and then returned to their own time, then sometime later timewaves would catch up to the present and everything would change all at once. The difference between BTTF2 and 'A Sound of Thunder' is that the timewaves were so subtle in BTTF2 that no one in 2015-B noticed them. Had Marty and Doc remained in 2015-B long enough, then reality would have changed around them into the 2015-C (Biff-altered reality). Marty and Doc left 2015-B soon enough to arrive in a 1985-C that the timewaves from 1955-C had already caught up to. The fact that old Biff made it back to his own timeline should have been an indication to him that his plans didn't work out in the end. There were effectively two timelines old Biff created when he gave the almanac to his younger self.However, once Marty got the almanac back in the alternate 1985, there was then no longer an alternate 2015. The alternate 1985 effectively stopped once Marty was able to fix things again. So when old Biff went back to 2015, there was only one version of 2015, since by that time the alternate timeline had been closed. When old Biff goes back to 1955 and creates a timeline B (which is reality now), he started to fade in 1955 of timeline A after handing the magazine to his younger self. Maybe this is because he doesn't live to be that old in timeline A after he makes his younger self a billionaire. Maybe it gets him killed before he can get past 1985 and that old. In fact, Marty actually stops timeline B from happening after all. So when he was fading back in 1955 after handing in the magazine, he thought the only way he can survive is by quickly going back to the future. But he arrives at the timeline A instead of B because he doesn't even exist in timeline B in 2015 because he gets killed long before 2015 in B. Also he still survives in timeline A for few seconds after arriving because of the slow fading theory and because he doesn't belong to timeline A either. Because time still allows you a few minutes to correct your mistakes, Biff arrived in timeline A. If he was smarter, he could arrive back in 2015 10 mins earlier so that he could stop himself from taking the Delorean back to 1955, thus stopping any changes or his death or go 10 mins behind in 1955 to stop himself giving the magazine to his younger self. But he was stupid and came to future where time was already changed and he didnt exist, so why A? He had a better chance to rectify his mistakes at timeline A than in B. He was more linked to A than B because he came from A and never been to B and the Delorean also belonged to A. Marty and Doc could not go back in A because they exist in B now. Old Biff doesn't exist in either, but came to A just by the mercy of time as a chance to rectify or bring the Delorean's molecular structure to where it belonged. In BTTF1, Marty traveled back to 1955-A and changed his future, thus creating a 1985-B where he didn't exist. The future took some time to change, but since he was 30 years in the past, changes took longer to catch up to him so it took almost half the movie for him to start disappearing, giving him the chance to fix things. When his parents finally got back together, he created a new 1985-C where he did exist and also time traveled, so he stopped disappearing. In BTTF2, Doc, Marty and Jennifer traveled to the future. How can their future selfs exist there if they disappeared in 1985? Because the timeline takes time to adjust like in BTTF1. If they had stayed long enough, they would have transitioned/faded into a new 2015 where their future selfs don't exist. Also, any changes they made to their future will be futile because the moment you know something about your future, you're already changing it. Biff traveled back to 1955-C and drastically changed the future, thus creating 1985-D and 2015-D (we never saw 2015-D). Again, changes took some time to happen, so when he returned to 2015, it was still 2015-C. He eventually faded into 2015-D in the deleted scene (dead or alive, doesn't matter) taking much less time than Marty in the 1st movie. Doc, Marty and Jennifer were still in 2015-C, but they weren't the ones responsible for the new 2015-D neither they belonged in 2015, so 2015-C only ceased to exist for them when they left in the Delorean. By traveling back to 1985, they entered the new 1985-D timeline created by Biff. Since they traveled back 30 years into the past, and then another 30 years into 1955, they had enough time to fix things before starting to disappear. The Delorean didn't exist in 1985-D because Doc was in an Asylum and never created it, but since it's the only tie-in between timelines, it cannot simply cease to exist, but it could still take damage, and eventually was destroyed in BTTF3. In BTTF3, Doc and Marty didn't disappear because their future was fixed, they only needed to return to it. Jennifer was left on the porch in 1985-D and when Doc and Marty shot their way into a new timeline (changing Clayton Ravine to Eastwood Ravine), she transitioned/faded from 1985-D into 1985-E while she was sleeping. Basically, all the original plot needed to be more consistent was the deleted scene and a better explanation from Doc about the "fading", but that could become too technical for the audience. Old Biff lest 1955 before young Biff had started to use the Almanac, or even realize its potential, so old Biff was ale to beat the ripple effect in the time machine to 2015. Remember that in the first movie, it took about a week for Marty's accidental change to the timeline to catch up with him, and that was thirty years of "new time". Now Biff has effected a change sixty years in his own past. If the ripple effect were linear, old Biff (and the original 2015) should hang around for about two weeks before changing. When Doc and Marty travel back to 1985, they run headlong into the ripple effect and end up in the alternate timeline. Not the answer you're looking for? Browse other questions tagged plot-explanation time-travel back-to-the-future-part-2 . Was the explanation of the Back to the Future 2 timeline correct? Paradox in Back to the future II? Would the crew have made it back to Earth anyway? 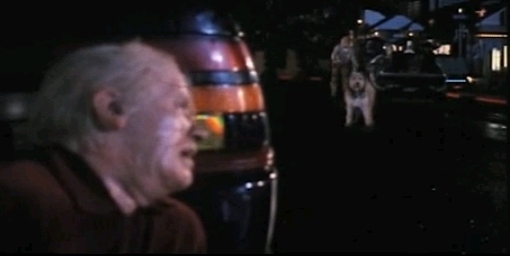 Did the same dog play Einstein in Back to the Future I and II? Would the Post Office really deliver a letter decades after postage like in Back To The Future?